Image caption The Guggenheim said it was "dismayed that we must withhold works of art"
The Guggenheim Museum in New York has pulled three exhibits featuring animals after receiving "explicit and repeated threats of violence". Campaigners had complained that the works showed "cruelty against animals in the name of art". A petition to pull the exhibits had gained more than 500,000 signatures. The museum said they will not now be shown "out of concern for the safety of its staff, visitors, and participating artists". The works were due to be in an exhibition titled Art and China after 1989: Theatre of the World, which opens on 6 October. One of the works, titled Dogs That Cannot Touch Each Other (2003), shows a film of pitbull dogs on treadmills that aren't able to reach each other. The American Society for the Protection of Cruelty to Animals issued a statement objecting to the "cruel manipulation of animals". It said: "Such treadmills are typical of brutal dog fighting training regimens, and the mere positioning of animals to face each other and encourage aggression often meets the definition of illegal dog fighting in most states." Last week the museum had defended the exhibit as "an intentionally challenging and provocative artwork". "We recognise that the work may be upsetting," a statement said. "The curators of the exhibition hope that viewers will consider why the artists produced it and what they may be saying about the social conditions of globalisation and the complex nature of the world we share." The other exhibits are Theatre of the World (1993), in which insects and reptiles live in a see-through dome and eat each other; and A Case Study of Transference (1994), a video of a previous live performance of two mating pigs stamped with Roman and Greek letters. 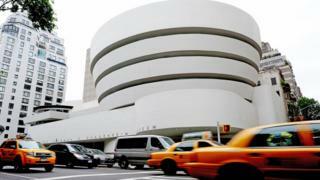 The museum said it was "dismayed that we must withhold works of art", adding: "Freedom of expression has always been and will remain a paramount value of the Guggenheim."